HomeBusinessOpinion: Midland Bank Operatives Must Bear the Brunt of the Blame for Customer’s Assault – By Kwame Okoampa-Ahoofe, Jr., Ph.D.
Opinion: Midland Bank Operatives Must Bear the Brunt of the Blame for Customer’s Assault – By Kwame Okoampa-Ahoofe, Jr., Ph.D. Her name is Patience Osafo, and she is a self-employed toffee seller who plies her trade at Spanner Junction, not far from the Accra Mall. Her age is not given but she looks to be either in her twenties or thirties. I wouldn’t say that the grainy videotape widely broadcast on television offered me a lot of reliable clues to go by, except the very critical fact that she is seen with a little baby in her arms and is described in some of the news reports as a “lactating mother”. My brother-in-law could not bear the sight of the videotaped mauling of Ms. Osafo and her unnamed baby and had to turn off the set for a couple of minutes. Her story, even long before she was brutally assaulted by a young and well-built police officer called Corporal (Cpl.) Godzi Frederick Amanor (aka Skalla) was quite harrowing; we shall get to that in a moment. But for now, it is quite clear that any way that one looks at it, this entire episode of unremitting savagery and utmost depravity is inexcusable if also because it well appears to have been instigated by the very people who have had the rare privilege of using the victim’s life’s savings, however modest, to conduct profitable business, nevertheless. But that this unspeakable act of savagery was instigated by some of the employees of the Shiashie branch of the Midland Bank, near East Legon, remains to be forensically determined by either a mutually agreed arbitrator or the judge of a legitimately constituted court of law. 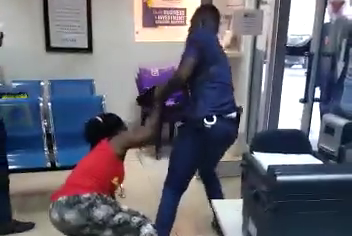 We know that this incident was instigated by an employee or some employees of the bank, despite the foregoing very careful observation of dispassionate neutrality, because we are told that it was either the Branch Manager or one of the staff members of the bank who had put through a telephone call to the police to have Ms. Osafo forcibly and physically removed from the premises because the victimized customer, who claims to have arrived at the bank to withdraw all her life’s savings of some GHȻ 270 had flatly refused to be moved, unless she was afforded access to her legitimately deposited money. Ms. Osafo says that Thursday, July 19, when arrived at the bank at approximately 7:30 am, was the fifth time in as many days that she had attempted to withdraw her life’s savings and met with absolutely no success. She owed quite a few creditors that she had to pay. Time was fast running out. Strangely, however, on each of the previous occasions that she had arrived at the bank at 7:30 am, she had had to wait until closing time, at 4:30 pm, or thereabouts, only to be rudely and insensitively told to go back home and return the next day. The reason given for the customer’s inability to gain access to her own life’s savings was that Midland’s computerized system was down. If this excuse has validity, then what it curiously means is that for a whole working week none of the tellers and the other workers at the bank had been doing virtually any work, as far as service to Ms. Osafo was concerned. Now, some internal auditors at Midland ought to find out and let the rest of us know whether, indeed, these virtually AWOL “workers” had received any paychecks for the one-week period during which this nursing mother was rudely and, it also appears, wickedly prevented from accessing her life’s savings. If they happen to have, each and every one of them, been paid for the period in question, then, of course, as New Yorkers are fond of saying, the workers of at least the Shiashie branch of Midland Bank have been taking their clients and customers to the cleaners. But for how long, we may never know. This extremely odd transactional anomaly must be promptly investigated for two important reasons, namely, the fact of whether, indeed, this is standard practice at the bank; and secondly, the reason why this particular customer whose traumatic experience is under discussion was so savagely treated. As of this writing, the authorities at Midland had just released a statement indicating their willingness to settle the matter with an unspecified amount of compensation to Ms. Osafo. My gut reaction here is simply as follows: “Not so fast, Buddies!” Needless to say, any serious attempt to settle the brutal and criminal assault on Ms. Osafo and her vulnerable breastfeeding baby must not be unilaterally determined on the terms of the administrators or managers and proprietors of the bank. Other than the brutal assault of Ms. Osafo and her infant by Cpl. Amanor, we are told that the latter is stationed at the Accra Regional Police Operations Unit, there is also a human rights issue at stake here, as well as the issue of the sort of excruciating and traumatic pain and suffering that were criminally and scandalously visited on both mother and child. As of this writing, it was reported that Cpl. Amanor, the officer called in by the Midland Bank’s branch manager to physically remove Ms. Osafo and her baby from the premises, had been arrested. That is prime grist for a wholly separate column. For now, though, what I want to emphatically observe here is that under absolutely no circumstances should Ms. Osafo consent to being compensated by the Midland Bank’s operatives without the formidable presence of a crackerjack attorney or lawyer. The victim needs to be reasonably compensated because the long-term effects of her brutal beating, and that of her baby, who was reportedly wrested from its mother by a bank employee so that Cpl. Amanor could have free room to bear more fully down on his female-adult victim, will take quite a while to determine. What this also means is that Ms. Osafo and her breastfeeding infant need to seek prompt medical examination and treatment, the total cost of which must be factored into any monetary compensation that may be awarded the victim and her baby. My parting words are simply “Good luck and pray for a miracle, Maame Patience.” For in Ghana, miracles can still happen, in spite of what our legion prophets-of-doom would have us believe. Opinion: Akua Donkor Must Be Hauled to CID Headquarters for Interrogation – By Kwame Okoampa-Ahoofe, Jr., Ph.D.